Turkey legs are a speedy alternative to preparing an entire turkey. 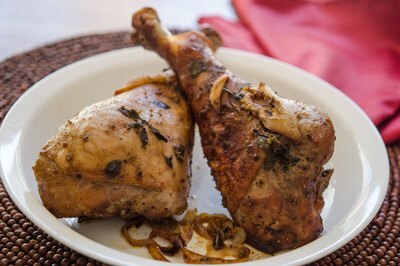 They are often sold at festivals and fairs; however, since turkey legs aren’t a commonly prepared home meal, you may not know how to long to cook them. The cooking time for turkey legs varies depending on your chosen cooking method. Grilling is one of the most commonly used methods for preparing turkey legs. The total preparation time for grilled turkey legs is 30 to 40 minutes. If you plan on soaking the turkey legs in a marinade beforehand, factor in an additional four to 24 hours marinating time. Once the turkey legs are marinated or seasoned to your preference, heat a grill to “Medium” heat. Add four to six turkey legs to the grill and cover with a lid. Grill the turkey legs for approximately five to 10 minutes, then uncover the grill and turn the legs over. Replace the grill cover and continue grilling and flipping the turkey legs every five to 10 minutes until they are golden brown. Turkey legs generally require 20 to 30 minutes of total grilling time. Remove the turkey from the grill and let sit for 10 minutes before serving. 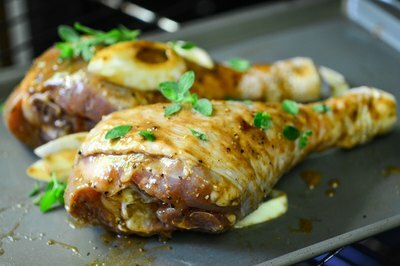 For an indoor cooking alternative, roast turkey legs in the oven. Cooking turkey legs in the oven is more time consuming than grilling and usually takes about two hours. Preheat your oven to 325 degrees Fahrenheit, then coat or season four to six turkey legs to your desired flavor. Grease a roasting pan with butter or cooking spray, then add the turkey legs in a single layer. Cover the pan with aluminum foil and roast in the oven for one hour. Remove the aluminum foil, then cook for another hour or until the turkey is golden brown. Let the turkey sit for 10 minutes before serving to retain the juices. Cooking times may vary depending on the thickness of the meat or the power of your cooking device. Regardless of the cooking technique you use, measure the internal temperature of the turkey legs even if they appear done on the outside. It can also prevent you from having to cut into the meat to check for doneness. According to the United States Department of Agriculture, turkey must be cooked until its internal temperature reaches 165 degrees Fahrenheit. 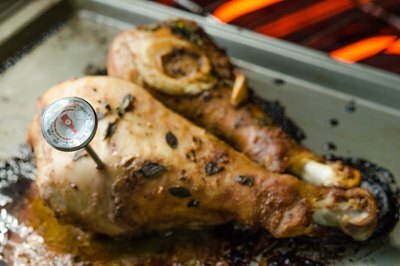 Insert an instant-read meat thermometer into the thickest part of the turkey leg meat. Avoid placing the thermometer near the bone or into any areas containing gristle. If the thermometer measures less than 165 degrees Fahrenheit, cook the turkey legs for an additional five to 10 minutes and measure again.